» A Review by Ray O’Leary: ARTHUR LYONS – Other People’s Money. A Review by Ray O’Leary: ARTHUR LYONS – Other People’s Money. ARTHUR LYONS – Other People’s Money. Mysterious Press, hardcover, 1989; paperback, 1990. Los Angeles private detective (L.A.P.I. for short) Jacob Asch is hired by a Turkish businessman to keep tabs on his daughter, who has come to L.A. with a Greek gentleman. The Turk even springs for two more investigators to assist in the surveillance, but, shortly after the first report, calls off the case. When one of the assistants suddenly turns up missing, Asch noses about a bit and discovers the body of the Greek gentleman, buried in the yard of a rented house, a discovery that unexpectedly propels him into the world of Stolen Artifacts and dealings in same conducted by prestigious museums and fanatic collectors. This one’s pretty good; lots of double-crossing, backstabbing, lying, cheating and everything else you look for in a Stolen Artifact book. Try it. Note: A complete bibliography for Arthur Lyons was posted on this blog at the time of his death in 2008. Follow the link. I always liked Lyons, and was real sorry when he quit writing to run his Dad’s restaurant. I’m not sure, but maybe he was glad to have a backup when his book contract ran out. Things like that happened to a lot of PI writers around that same time. But I’m with you. Lyons was one of the better ones. I like Arthur Lyons alot also. 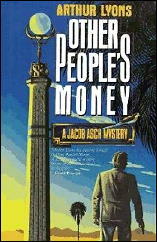 His private eye, Jacob Asch, was different from the usual PI. Asch was more realistic and down-to-earth than other PI’s of his era. As I recall (and I hope correctly) he did a lot more of the day-to-day, routine drudgery that PI work actually entails, instead of the wildly imaginative exploits you read about only in books.